If you're lucky, you may never know how good your laptop is. I found out. On Monday, September 27th, 2004, at approximately 10:30 a.m., I was traveling from San Jose, California, to South San Francisco on Interstate 280. I was driving a Honda XL 600 motorcycle in the HOV lane with my Sony Vaio laptop in my backpack. I was running right at 95 miles per hour when my backpack zipper suffered a catastrophic failure, spilling my laptop onto the interstate. I stopped immediately, and ran back to try to salvage what I could. I found my passport, some pencils, and a few other items before I located the laptop. 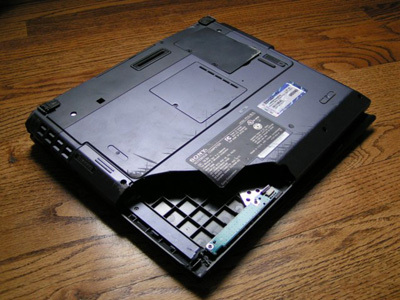 The laptop had crossed all four lanes of the interstate, and was resting upside down on the shoulder. It was, of course, badly damaged. Both batteries were ripped from the laptop. The screen frame was broken. A large portion of the bottom plastic was missing. The ports in the back were badly cracked and pushed out of alignment. But when I got to the office and plugged it in, it booted right up. View more photos here.